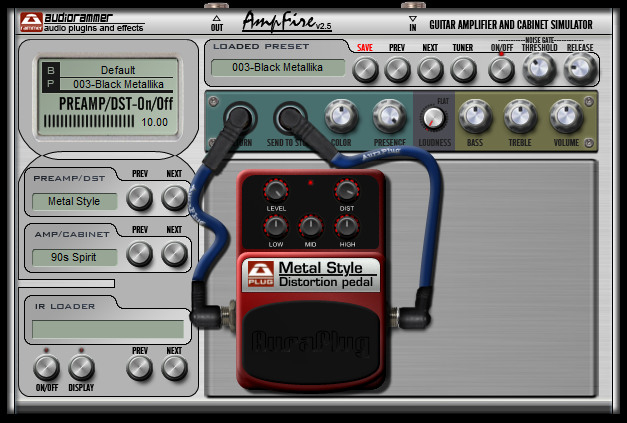 AmpFire is a special VST effect designed for metal guitar players. AmpFire is a preamplifier, distortion, power amplifier and speaker cabinet simulator in one. AmpFire does not contain effects (except for an input Noise gate). We focused on guitar-sound and low CPU usage when designing AmpFire. Plugins deriving from other manufacturers are easy to add to post-AmpFire VST series. Countless VST effects are available for this. There’s an input Noise gate in AmpFire, which is indispensable in highly amplified systems. Right after that comes the Amplifier-Cabinet unit and finally Bass, Treble, and Volume control. How many times has it occurred on stage or in a studio that a good acoustic guitar sound would have been needed, but that’s not easy to attain neither on a stage, nor in a studio. (just think of the acoustic feedback effect for instance) As an alternate solution, we model the sound of the acoustic guitar and generate it from the electric guitar’s. Several software solutions have been worked out for the simulation of the acoustic guitar’s sound, but none of the products have achieved a truly realistic sound so far. The simulation of AmpFire Acoustic Guitar is trying to fill up this empty space. The acoustic guitar simulation found in the AmpFire generates a piezo acoustic-effect guitar sound from the electric guitar sound with the help of a special algorithm. When modeling the acoustic guitar one of the greatest challenges is generating the body-sound, typical characteristic of acoustic guitars. With the help of a special algorithm AmpFire adds this lost ‘body-sound’ to the sound of the electric guitar, generating the feeling of a piezo acoustic guitar’s sound. Currently AmpFire plug-in contains one body model, with tone control options. Among the sound samples there’s a ‘before/after’ sample on our page, the first part of which contains the sound of an electric guitar without added effects, and then the same sound with AmpFire Piezo Acoustic simulation.